One of the most important decisions you can make regarding undergoing plastic surgery is choosing the right plastic surgeon. After you are quite confident that you have selected a very skilled and experienced board-certified plastic surgeon, the next important issue of consideration is where the surgeon performs the procedure(s). Even an excellent, ethical surgeon can’t always overcome issues associated with a substandard or unlicensed facility. Your safety, the overall outcome of your procedure, and the risk for complications can be adversely impacted in such situations – problems that you definitely want to avoid. This will ensure that the facility meets the standards for quality medical and surgical care to provide patients with safe and effective procedures. Surgeons who are granted hospital privileges at an accredited hospital have also undergone rigorous evaluation and verification of their credentials. The Leapfrog Group is a national nonprofit quality improvement organization that designed the Hospital Safety Score to assess the degree of patient safety offered by a particular facility. It rates how well hospitals protect patients from infections, injuries, errors, and accidents, and an “A” rating is the top grade a hospital may receive for patient safety. Dr. Turkeltaub performs nearly all of his surgical procedures at Piper Outpatient Surgery Center, which is located near our Scottsdale office on the Scottsdale Healthcare Shea Medical Center campus (which it is part of). Piper Surgery Center has all the required accreditations and meets the requirements for high standards of care and safety. It upholds the consistent “A” grades in Hospital Safety Scores held by Scottsdale Healthcare Shea Medical Center and offers comprehensive, superior care from qualified, dedicated nurses. It also has an overnight recovery center staffed by well-seasoned nurses attuned to the needs of plastic surgery patients, which can make immediate postoperative care far more pleasant and comfortable. Nonsurgical and minimally invasive procedures do not have the risks associated with surgery. For this reason, it is generally safe to have a board-certified plastic surgeon perform these procedures in an office-based facility. 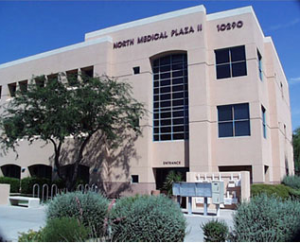 We perform a variety of minor cosmetic and reconstructive procedures in our comfortable and convenient Scottsdale plastic surgery office, which is located in the North Medical Plaza II building on the east side of the Scottsdale Healthcare-Shea campus. If you are interested in any breast procedure, please schedule your consultation with breast enhancement specialist Dr. Steven H. Turkeltaub. Please call (480) 451-3000 today, or you may fill out our online contact form for more information.